It was a chilly day out and Sebastian was pacing around his shop, wearing a hole in the floor as he impatiently continued the wait for his new shipment to arrive. He had received a short message a couple days ago stating that due to the inclement weather, the new shipment may be late a day or two. Grabbing his mug of coffee, he took a slow sip, allowing the caffeine to gently soothe his nerves. Just then, he heard a honk outside and eagerly rushed out, ignoring the frosty air nipping at his furry skin, ecstatic that the shipment had finally arrived! After a brief chat with the delivery man who told him that the last item would arrive a little later on, he decided to release the two items that had arrived first. Quickly, he bustled about, getting the new items set up, saving room for the last item whenever it may arrive. Once everything was all ready, he went outside, grinning amiably at the awaiting crowd, the atmosphere heavily palpable with excitement and anticipation, as he began. �Hello, hello, everyone! Many apologies for the slight delay, the recent cold and icy weather has made it difficult for the shipment to make it here on time, including the third item of the shipment. �C�mon everyone. Time to buy my new goods! 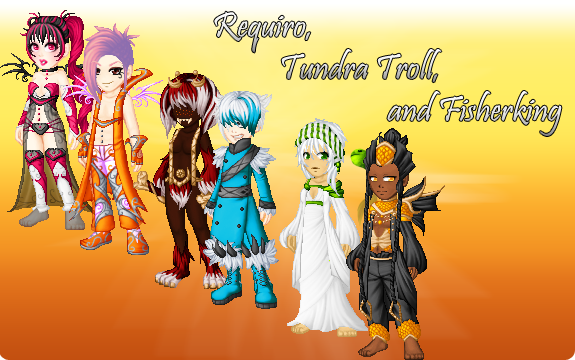 The rune items will remain available until March 2nd, while the aurum item will stay in stock until March 7th. So get them while you can!! Another quick lap of the shopping square completed, his announcement spread to all he could reach, he made haste toward his shop, eager to serve the awaiting customers he hoped would be there.